Vibrant ruby red meets reduced agate grey: rich colours are set off to best effect when alternated with natural tones. This helps to put individual areas in the spotlight or to set them consciously in the background. 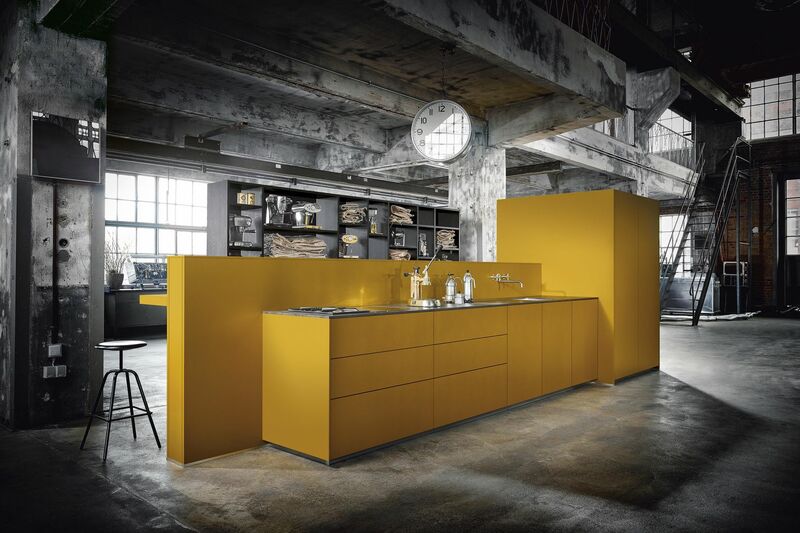 NX 500 – the warm saffron yellow stages the kitchen as the heart of the room. NX 500 – innovative material mix: Jaguar green satin lacquer meets warm old oak and brilliant white ceramic with a marble effect. The use of colour or the deliberate avoidance of it shows the special aesthetics of the Bauhaus concept – as well as its adaptability, openness and freedom. Who would have thought that even colourful painters such as Wassily Kandinsky or his Colleague Paul Klee helped to characterize the Bauhaus movement? The next125 kitchen fronts combine shades such as crystal white and agate grey with colourful accents: stronger tones such as saffron, curry and cognac, or darker nuances such as indigo blue, jaguar green or ruby red. NX 902 – Indigo blue fronts in combination with tall units and recess panels in old oak catch the eye. NX 510 – sand grey matt velvet lacquer gives the surface a silky impression. Colours are set off to best effect in particular when they are to be seen in alternation with natural tones. 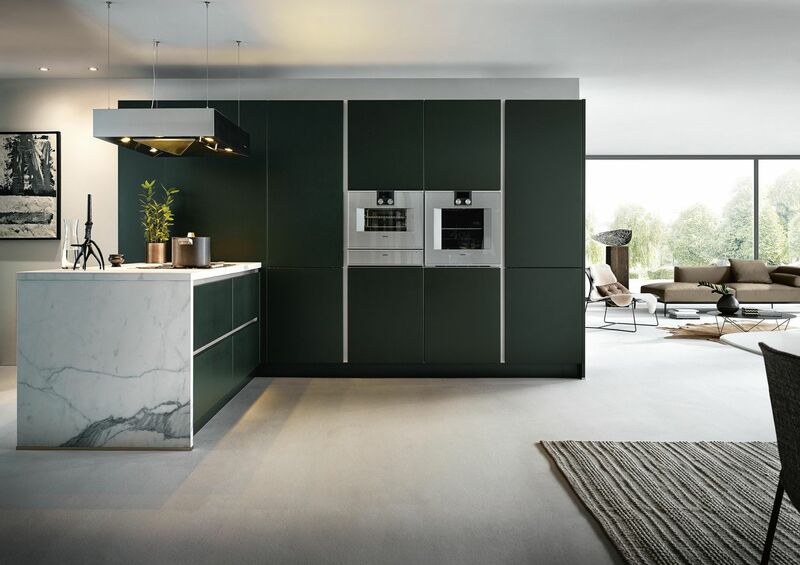 The Bauhaus principle of reduction can therefore also live on in next125 kitchens in the combination of colours or non-colour. The result: simple elegance paired with vibrant accents. 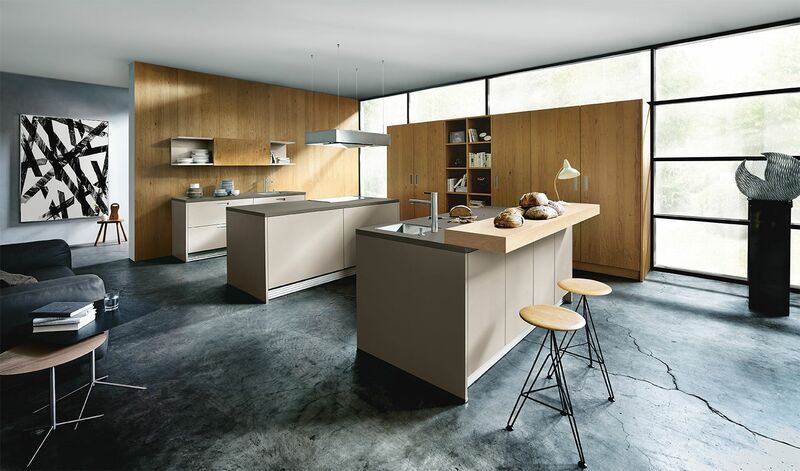 NX 500 – stone grey satin lacquer lends calm and structure to the open kitchen. NX 620 – the harmonious effect of the fir wood combines with the clean, modern polar white. The variety of the materials used and the finishes available ensures a broad spectrum of possibilities: whether matt or high gloss, the purest white or natural tones, discreet grey or ruby red. Whether through-dyed laminate, elegant lacquer or high-quality wood types. 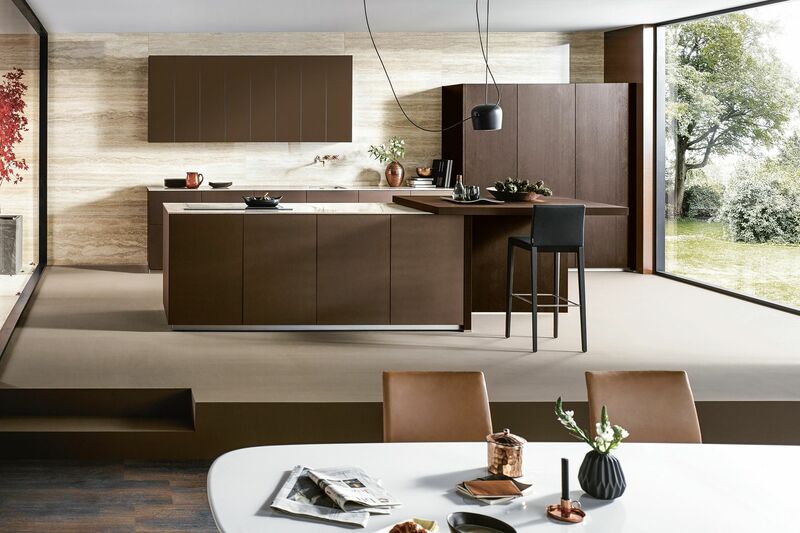 Whether satinated or smooth finished – next125 enables the consciously planned designer kitchen. Glass fronts add an additional effect thanks to their intrinsic colour facets and bring metallic tones such as bronze and platinum into play. Ceramic fronts in concrete grey or graphite are available. 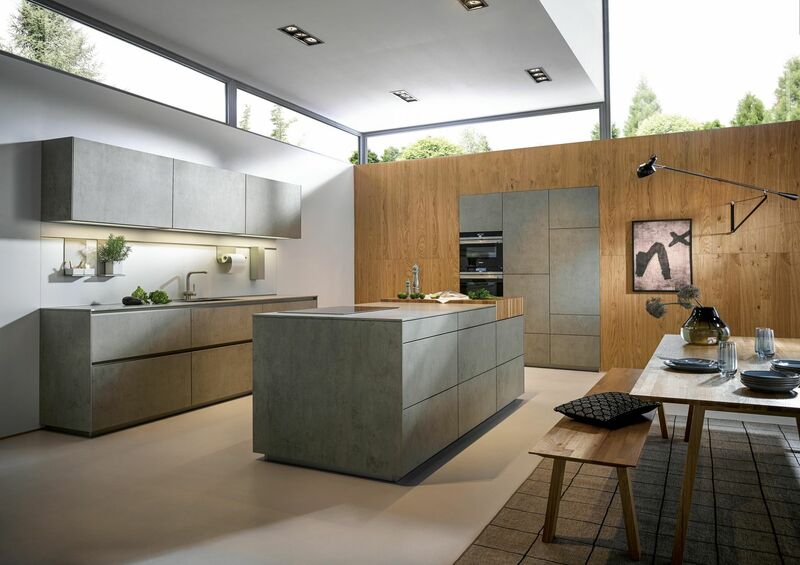 NX 950 – the authentic material ceramic in ceramic concrete grey effect simulation gives a modern mark to the kitchen. The next125 palette is large, and invites you to express, and not just with its personal favourites. The mood of the room and effect can be influenced with its help and the appropriate highlights. In this way, the colours help to brighten up your own kitchen or set it reduced into the background.